Silent Pictures, running from September 1 through October 11 in the James Gallery in NYC focuses on aspects of comic book structure that do not depend on words to advance an image sequence. The exhibition is inspired by artist and Pulitzer Prize-winning author Art Spiegelman's personal collection of wordless comics and graphic novels -- mostly black and white rare artist books from the 1930s. The show will feature a selection of these books, as well as more recent "abstract comics," and a related film program -- all of which investigate essential qualities and aesthetics of this hugely popular medium. 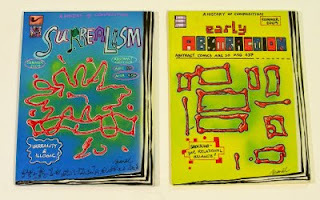 The abstract comics, compiled by art historian and artist Andrei Molotiu for a just released anthology, Abstract Comics Fantagraphics Books, 2009), call attention to the formal mechanisms that underlie all comics. The art gathered by Molotiu emphasizes the dynamic graphics that lead the eye and mind from panel to panel, suggesting that these structural elements are fundamental to the emotional register of the medium. 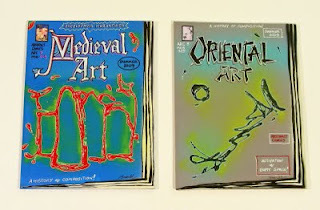 This section of the exhibition features an old-fashioned wire magazine stand ("spinner rack"), which hosts a collection of paintings by Mark Staff Brandl called A History of Composition in Abstract Comic Covers. 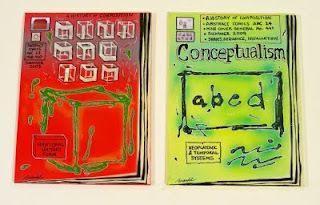 Done in oil, acrylic and collage on canvas panels, the 30 pieces in this series unite comics, pop art and Pollock-related abstraction with his actual interpretation of the history of composition in painting from Prehistoric times until now. The James Gallery is located off the lobby of the Graduate Center at 365 Fifth Avenue (between 34th & 35th Streets). Hours are Tuesdays through Fridays, 12-8 pm, and 12-6 pm on Saturdays & Sundays. Admission is free; for more information call 212-817-7138 or visit http://www.gc.cuny.edu/events/art_gallery.htm An opening reception for Silent Pictures will be held on Thursday, September 10, 6-8 pm.